The people behind "Skin MD Shielding Lotion" sent me a sample of their cream to try out and, if happy with the results, to blog about. You don't have to twist my arm to try a new product, and since they sent a whole 4 oz. bottle, I decided to also share it with my co-workers and get different opinions. The trial started with just Barbara and myself. As soon as we tried the cream on our hands for the first time, we did notice that it felt different than our usual hand lotion. The best thing about it, was that it dried out completely, without leaving any greasy residue. I am very finicky about greasiness. Even when I use my regular hand cream I always follow up with a paper towel to dry it out. With this cream I didn't need to dry any greasy residue. So the first impression was positive. We decided to continue using it twice a day, and to keep an eye out for any noticeable skin improvements. The improvement I could go for was "younger hands". I am in my 30s, and even though I have no wrinkles on my hands, they are a lot drier than they used to be, and dry hands can look "older". So if this cream could get me my young hands back, I would be sold on it. Now, you can't keep a secret in my office, so by the afternoon Karla was also rubbing the lotion on her hands. Again, another good first impression. She was delighted with the consistency of the cream and the fact that it didn't have a strong scent. She became tester no. 3. On the second day, I divided the lotion amongst us three, and we rubbed our hands smiling. New York is still pretty cold these days, and our skin was definitely welcoming this cream. People must have noticed the smiling, and now Tanya wanted to try some. After a couple of days there was a steady flux of people coming to my desk and using the lotion. Nobody even asks for it anymore: they just come by, grab the bottle, squeeze a bit, thank me and leave. It's only been a week, too early to tell of any lasting benefits, so we'll keep using it until it runs out on us. After that, will we buy it? We're not sure yet. We all think that $25 plus s&h is a bit expensive, but if we will experience any of the lasting benefits (i.e. if my hands look younger, if Karla's cuticles soften up, if Barbara stops picking at her dry skin) then we will definitely buy (maybe even share) another bottle. 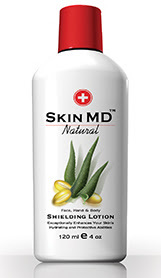 To find out more, you can visit their website at SkinMDNatural. Haha. Awesome review :) Sounds like its worth an office split for a bottle.